Saving Mr. Banks is based on a true story. Well, it’s based on a true story the way the movie Mary Poppins is based on the book Mary Poppins — which is to say loosely, and without some of the really unusual and intense juicy parts. The movie tells the story of author P.L. Travers (Emma Thompson) and her collaboration with Walt Disney (Tom Hanks), et al, on the movie adaptation of her beloved children’s book, an adaptation she was loath to agree to in the first place. In Saving Mr. Banks’ end credits, we hear some of the actual tape recordings of Travers’s contentious writing sessions with Disney and two of his most successful songwriters, Richard and Robert Sherman (played in the movie by Jason Schwartzman and B.J. Novak). Was she cantankerous? Hard to please? It sure seems like it! But the movie distorts or just plain leaves out some interesting facets of Travers’s life — omissions that would have created a deeper, more interesting depiction of Travers and would have made the Disney intellectual-property-gobbling machine a bit less sympathetic. P.L. Travers was a mother. Banks doesn’t acknowledge this at all, but at age 40, Travers adopted a son, Camillus. She did not, however, adopt his twin, and when Camillus was 17, he and his twin bumped into each other at a pub, ripping open Camillus’s relationship with his mother (who, until that point, he thought was his biological mother). Banks presents Travers as sort of odd and unloving, and maybe she was. But she did raise a child — a child from whom she was estranged when she finally agreed to Walt Disney’s years-long attempt to adapt Mary Poppins. Travers never married, but she did have relationships with male and female partners. Flirtatious, charming, smart, unmarried, and a welcome addition to the convivial pub scene, she had the bounder’s willingness to press her work on anyone who might help her, and when her submission of poems to the Irish Statesman was met with a promising letter from its editor, the poet George Russell—known as A.E.—she went to Dublin to see him. A.E., a married man of fifty-six, was a reckless encourager of young people. His literary connections extended from the house next door—the Dublin home of Yeats—to New York and the Continent, and he offered them all to Travers. A theosophist, he urged her to take up the study of mysticism, which became a lifelong preoccupation. They began a relationship that was filial, intellectual, and marked by romantic gestures. It lasted until his death, ten years later. Yes, P.L. Travers cried at the movie premiere — but not the way it was portrayed in Banks. Also, if Travers ever reached a state of peace regarding her father’s death, she didn’t mention it in a 1994 interview with the New York Times. 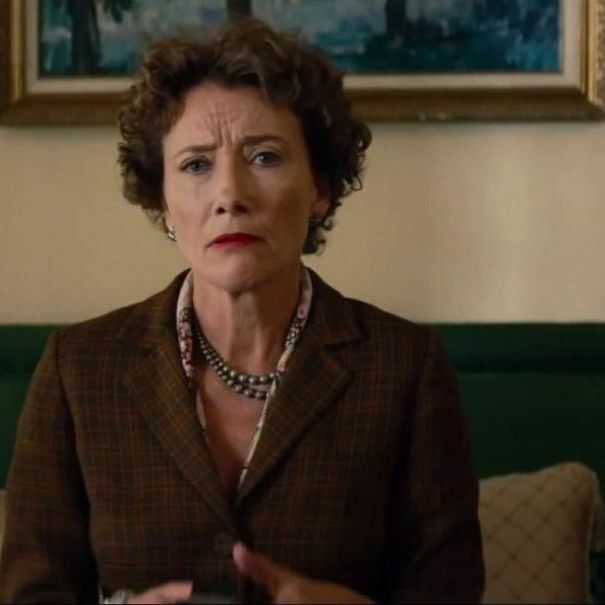 Saving Mr. Banks presents giving up one’s artistic integrity as a therapeutic process — isn’t it ultimately in P. L. Travers’s best interest to allow her characters to become unrecognizable in the hands of a giant corporation? I mean, sure, it’s sort of noble that she wants to retain creative control of her own actual ideas, but weigh that against the catchiness of “Let’s Go Fly a Kite.” “Kite” wins every time! And that’s where the discomfiting feeling of having consumed propaganda comes from. Saving Mr. Banks is produced by Disney, and stars Tom freaking Hanks as Walt himself. Of course Disney — the man and the corporation — will prevail! But it could have been a fairer fight in the movie, and what was presented as a joyless, loveless pedant finally giving herself over to the delight and imagination of the Wonderful World of Disney could just as easily been presented as a creative, passionate person, with dignity and real emotions, getting steamrolled by one of the most powerful companies in the world. Chim-chim-cheroo.